Woooooooooo! Only 10 more days before the first ever Peace Fibre Fest! We’re getting so excited! Here’s our layout in case you’re wondering where to find your favourite vendors! We’ve added a few more classes and demos to the day’s activities at the Fibre Fest. Whether you’re wanting an in depth 2 hour class about gauge and fit, or a free 10 minute demo about chain plying, keep checking in on the classes page for new options that might be of interest. Classes and demos are a great way to expand your skills, especially if there are classes or demos that aren’t offered in your area. Our first 2 instructors have confirmed their classes! Check out the new “Classes” tab on the main navigation bar for details. So far, we have a beginner spinning class and a knitting class all about gauge, swatch and fit, and there are a couple more in the works. We’re hoping to add a few more, as well as a few demos in the next few weeks, and we’ll be adding a registration link for those that require pre-registration. Why not pick up a new skill when you come? For me, the anticipation for an event starts long before the event itself, which means that I’m already stalking the shops of our vendors to plan out my purchases next April at the Fibre Fest. Pretty yarn on paper can become pretty yarn in person! If you’re the same, or know someone else who is, a stocking stuffer to a Fibre Fest is just about the perfect gift! 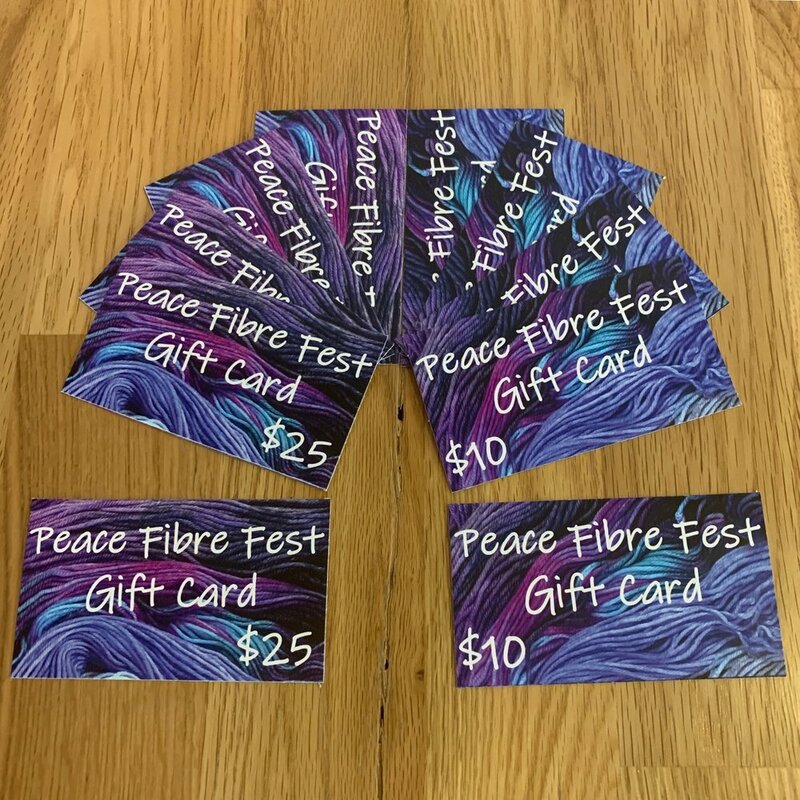 The Peace Fibre Fest now has gift cards available in both $10 and $25 denominations, which can be picked up from now until December 22nd at Faking Sanity if you would like one in time for Christmas. Thanks so much to all the wonderful people who applied! Applications for vendors are now closed, as we’ve filled all the spots for our first year, and we’re thrilled about every single one! Check out the vendors tab over the coming weeks - we’ll be highlighting one of our vendors every few days, so that you all can see why we’re so excited! We’re starting out todaywith one of our local vendors, and then we’ll tell you a bit about all those travelling here for the event. Questions and applications started rolling in mere hours after we put them up on the website and sent them out to our vendor mailing list. So, first of all, thank you to each of you for your enthusiasm - it was truly humbling to get such a great response so quickly. We’ve now started reviewing applications and confirming vendors. We’re trying to keep a good balance of vendors, so that there’s a little bit for everyone attending - regardless of their preferred fibre craft - so, we’re reviewing applications in batches. Subsidy applications will be reviewed at the end of the application window, so that everyone who wants to apply has a chance to do so before the funds are alotted. If you’re interested in vending, we’ve added an extra 2000 square feet to the main ballroom we originally booked, so there a fair number of spaces left again. Submit your applications soon, though, if you want to ensure your best chance to get a spot, or to get a booth of your preferred size (double booths and 9’ x 9’ booths seem to be in highest demand). We’re thrilled to be able to showcase local Alberta and BC artisans, especially those from the local area, but it’s also exciting to see applications roll in from Saskatchewan and the Territories as well. As Northerners, we tend to buy yarn online - sight unseen and skein unsquished - so it will be such a treat for our local people to be able to see and squish yarn and fibre in person, from so many diverse vendors both near and far. If you would like to be involved in the event in some other way, please let us know. Whether you’re interested in billeting a vendor, providing a door prize, or volunteering on the day of the event, we’ve got lots of ways for local people to get involved and make this event a success for vendors, attendees, teachers and volunteers alike! We’ve gone to several fibre fests over the years, but this fall was the first time we took part in a fibre fest as vendors. It was a blast, and we were lamenting that there was nothing similar closer to our area. Then, last weekend, a friend came into the shop, and we were talking about the fibre fest, and I made an off the cuff, joking remark about starting one here in Dawson Creek. Then, we started seriously considering it, and about 3 hours later, already had several pages of notes and ideas. Last week was a whirlwind of research, phone calls and emails. From planning dates and finding venues, to talking to established fibre fest organizers, to pitching the idea and confirming our first few vendors, the metaphorical ball got rolling very quickly! We’re now just waiting on a few key details from our venue in order to fill in the last blanks on our vendor information packet and application, and we’ve got a webpage, email address, and social media accounts. Wheeee! Since we also run the Faking Sanity shop in Dawson Creek (and the Faking Sanity group on Ravelry and Facebook, as well as the Faking Sanity podcast), you’ll see lots of Fibre Fest news in those places, too.